On January 27, 2001, "Nickel Empire: Coney Island Photographs 1898-1948" opened to the public at Schroeder, Romero and Shredder (somewhat of a scary name for a dealer in works on paper.) The photographer E.E. Rutter is featured, as this image of George C. Tilyou’s famous Funny Face is on view. The exhibition of photos is supplemented with a charred wooden horse from the Steeplechase ride that survived one of the park’s infamous fires. From the gallery's website: "Nickel Empire consists of over two dozen vintage photographs of Coney Island dating from 1889 to 1948, displaying in rare clarity the twentieth century’ s great American playground, once described as 'Sodom by the sea.' Coney Island was a sanctioned escape from—and alternative to—everyday reality. 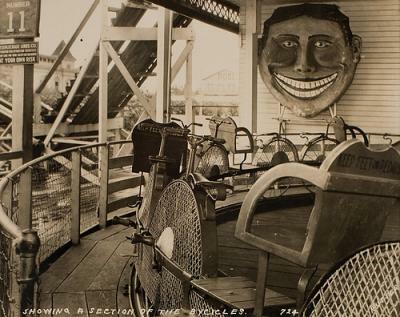 The various rides, reenactments of disasters, freak shows, and other amusements highlight America's obsession with a bliss tinged with danger, and the thrill we find in spectacle. The photographs in the exhibition include scenes of scale models of rides, incandescent night views, people at play, and the great Bowery fire, among others. Machines of industry were turned into instruments of play and let loose the bright forces and dark possibilities of a vast democratic culture that was astonished, delighted and appalled by Coney Island. Also on display is the charred remnant of a Steeplechase wooden horse, now a monument to America's lost innocence."